It’s been a busy time in the studio this month. September has a rather large deadline for me (on a secret project that I can’t wait to tell you about!). It’s also the start of Spring, here in Australia. And my little miss also has a birthday. So I’ve been sewing lots of different things and juggling a number of projects at once. But one of the most important was a bedroom makeover for my daughter’s 7th birthday. 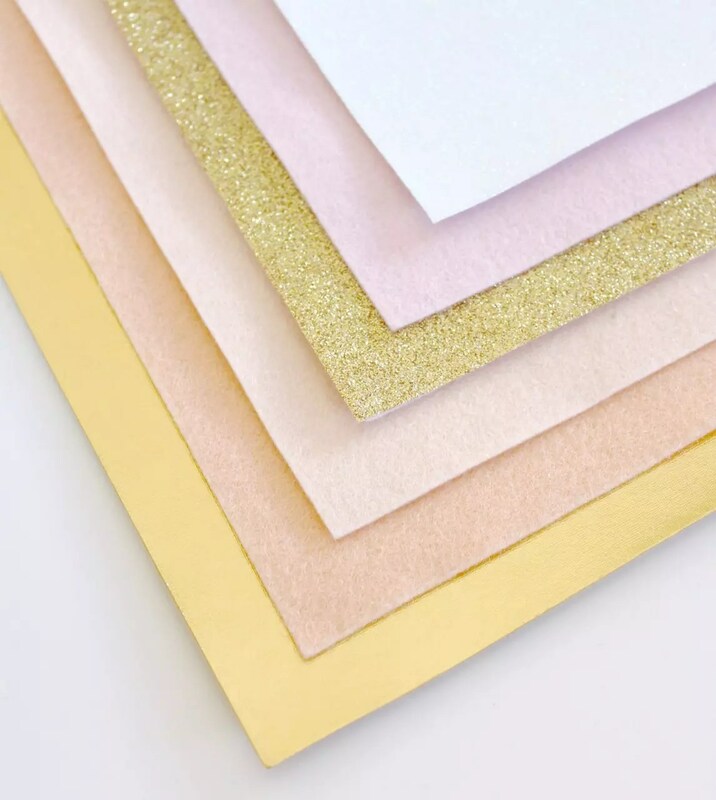 I have to confess that she’s spent so much time peering over my shoulder (while I look at all the pretty things on Instagram), that she’s developed an obsession with all things peach and gold. So it was time to update her adorably floral and frilly bedroom to something equally as pretty, but more up to date. Coco’s been begging for gold wall dots and pink and peach accessories for ages. So I figured I’d ‘go the whole hog’ and transform her entire bedroom. 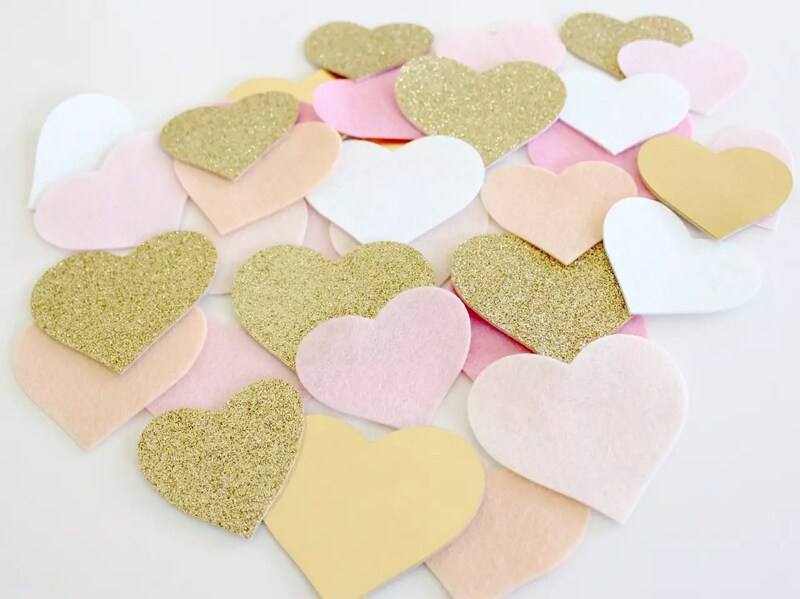 One of the simplest projects (but also the most effective) was to create a pretty felt heart garland made with hearts in all her favourite colours; peach, pink, apricot, white, and also metallic and glitter gold! Much of this lovely 100% merino wool felt came from Rose Petal Collections. Candice’s range is stunning – especially her glitter felt! So after pulling a pretty bundle of felt, it was time to get cutting. Luckily for me, my Sizzix Big Shot Plus machine has a heart shaped die template that was perfect for this project. It took me no time at all to cut out a heap of heart shapes in two different sizes and a range of coordinating colours. Don’t they look lovely here? I used these hearts on a couple of simple decorating projects. 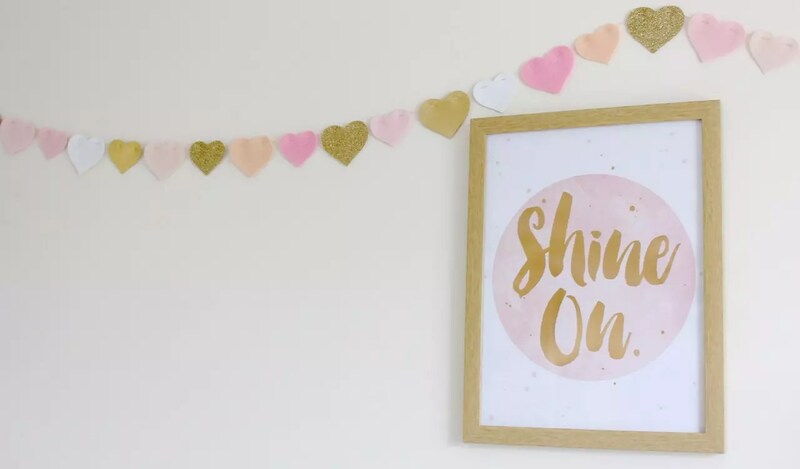 I’d love you to pop over to the Sizzix blog to read more about it and get all the specific details for creating this pretty felt heart garland. And then stay tuned for the big bedroom makeover reveal! I hope I can share it with you really soon.